We have now updated and simplified the instructions for playing Statis-Pro and even added short tutorial videos here. Note: Leading into today's Home Run Derby we reviewed all 6 current MLB Divisions (see photo) and the greatest 42 Statis-Pro teams in the South, West, Central, and East going back to Honus Wagner's 1902 Pirates. Today we go worldwide by updating the instructions on how to play the game with Statis-Pro cards for Shohei Ohtani vs. Ichiro Suzuki from their Japanese Pacific League and how to make your own cards for any player you want to use with our free Statis-Pro game (moved to here) and an update on our own Statis-Pro season and NL winning 2 of 3 Statis-Pro All-Star games but with the AL dominating the futures game based on these Statis-Pro cards for new stars. A. 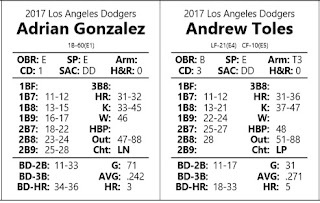 Two 6-sided dice to determine whether to use the pitcher's card based on his top PB (roll of 2-8 keeps it on Clayton Kershaw's card, or whether to use the batter's card (roll of 9-12 puts it on Aaron Judge's card). B. Two 8-sided dice of different colors (or this dice simulator or Fast Action Cards) to get a result of 11-88 to find on that card. Basically, one of four things happens; a, an OUT if the 11-88 shows K or Out; 2, the runner gets to base on a W or HBP; 3, any runners advance a base on a BK, PB or WP BUT if no one is on base those result in an Out; or finally, 4, the batter gets a hit (1b, 2b, 3b or HR). In this case pictured, the blue dice roll of 9 put the results on Judge's card, and the 27 made it a home run. 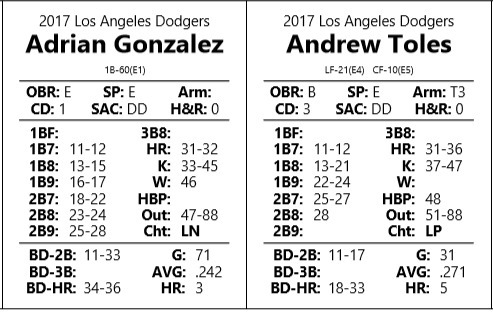 While I pasted samples of a full-line up with a pitcher for both the Dodgers and Yankees in 2017 to you can play a whole game this way, let's just play through an inning of Kershaw vs. Judge starting with that roll of a "9" and "27:"
To keep the game very simple, you can play out entire games or seasons that way. On hits, just advance runners as many bases as the batters except advance them an extra base if two outs (believe it or not, this is very accurate because an extensive study showed batters take an extra base just under one-third of the time (so with 2 outs but not with one or no outs is about right) and they were actually almost never thrown out trying to advance). ... and the google sheet will calculate cards like this (I entered the numbers above for both players). Rolling the same dice, you first look at the bolded number by PB (there is also a PB for passed ball further down - probably the one poor choice by the inventors!). The key to understanding these cards is that it is always showing you only the LAST number of the range - not the beginning and end like in the Kershaw and Judge cards above. 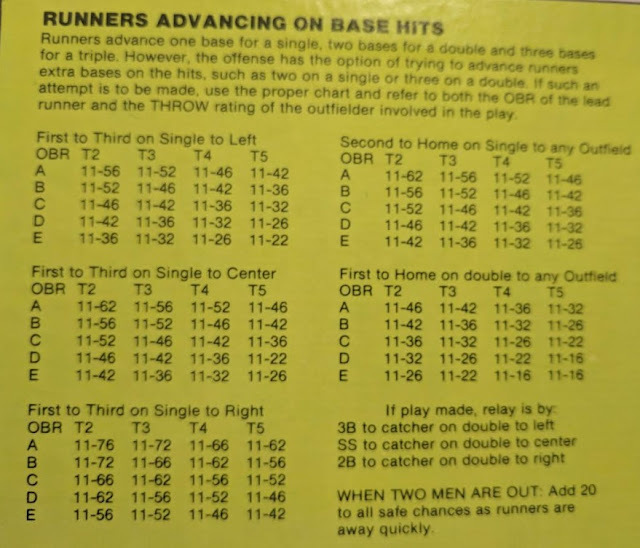 (Advanced Notes: There are some notes by the batter card because some numbers translate to the letters for baserunning, stealing bases, bunting and defense in the advance game). So in this case, the "10" in bold means that Ohtani is a PB: 2-10, and the 15 after the 1B: means he gets a hit on an 11-15, since 11 is always the first number. Then a 16 is a balk (BK), the 37 by strikeouts means it is 17-35 since it starts after the balk, etc. The numbers always end with an out through 88, so here that is 53-88 since outs start after wild pitches. If the roll is on Suzuki's card his 1b: number is 35, so he has singles from 11-35, etc., including home runs in red from 45-47. 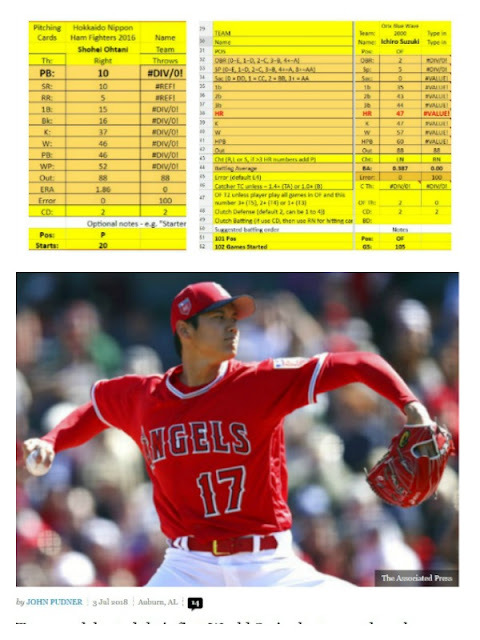 Ohtani's 2-10 put the result on his result on the first roll, but later when a PB 11 put it on Suzuki's card he hit a home run because his home run range goes all the way up to 47. 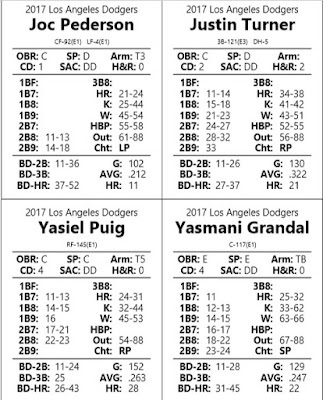 Finally, when you first look at the Advanced cards like the ones I bought through this link for my 42-team league of great teams, they look a bit confusing but just focus on the key lines. The big difference is to realize the same numbers are there (PB and RN) but you need to look at the column based on if the batter or pitcher is facing someone who bats or throws left-handed or right-handed. So to take a New York match-up from the Eastern Division of my four All-Time divisions, Dwight Gooden's PB when facing a left-handed batter is in his far left column and you can find that he is a PB 2-7 (under vLH). When he faces a right-handed batter he was actually not quite as good with a PB of 4-7 (under v RH in middle of the 5 columns). By the same token, if that roll puts the random number of Ruth's card you need to check to see if he is facing a left-handed pitcher (far left corner under vLH) or as in this case is in the middle column because he is facing a right-handed pitcher in Gooden (vs RH, 385 at bats, .379). Against lefties he only hit home runs on 16-27, while against righties he hit it out from 28-38. 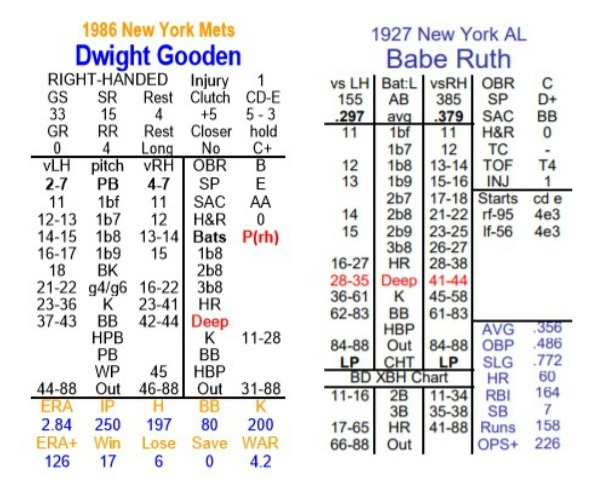 Let's again run through the same five rolls of the dice for Gooden facing Ruth as we did for the other two combinations to see how the inning would have played out. 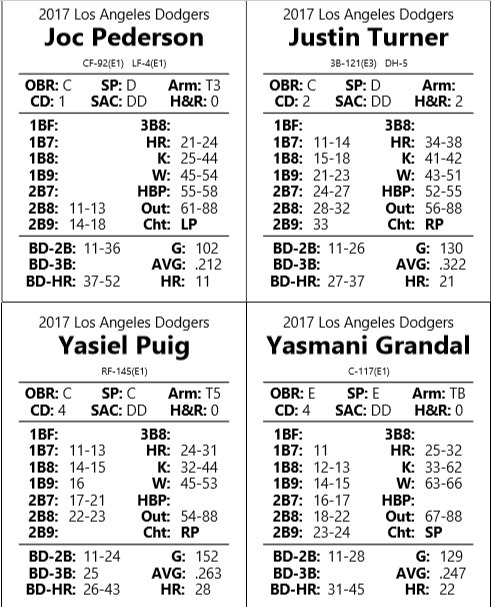 So whether you make your own cards, order all current players with basis cards like Kershaw and Judge on eBay from bigdave32, or find all-time career superstars at sites like this one, the basic game can be played easily as soon as you are used to identifying where the PB and Random Numbers are for each dice roll. Whichever cards you choose to use, the nice thing about the simple dice version is it can be easy to play even while traveling. Once you have the basic game down it is very easy to add base-running, fielding, clutch plays, unusual plays etc. by using a 20-sided die and printing out the free version of the game here. 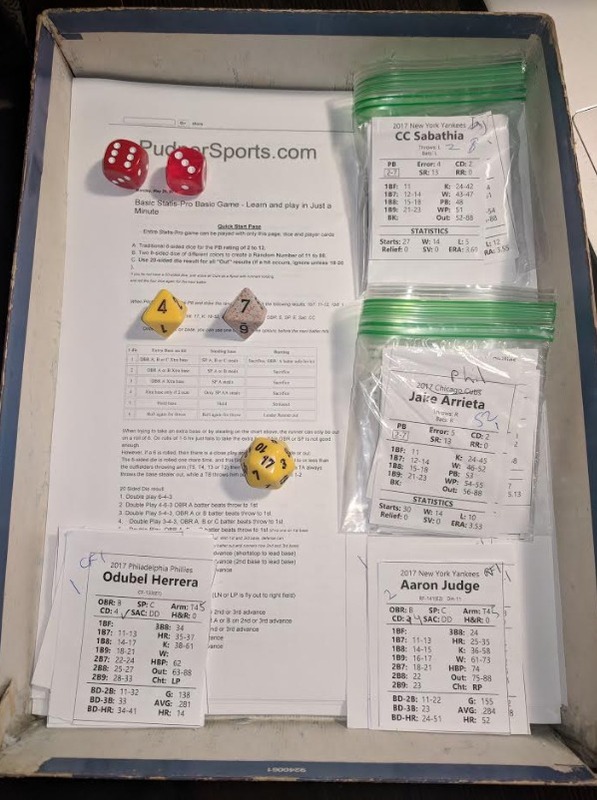 A 20-sided dice for "Out" results that will replace all of the other parts of the Fast Action Deck by giving you the result of the out below. You normally only need to look at the 20-sided die on an "Out" result, however if anyone is on base and that dies shows up as a "20" then you refer to the second page above for the interesting results that would result from a PB of BD, CD or Z on a Fast Action Deck. 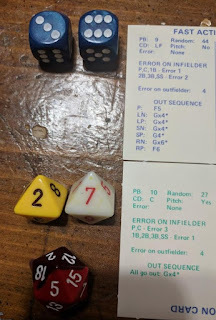 Advanced players should also check for an error if the other dice result in a hit on the batters card and the red die is 18 or 19. As detailed in green on the 1st sheet, when the 20-sided die comes up as a 18 or 19 on either an out or a hit on the batter's card, then you check for an error. You the 6-sided and 20-sided dice again. The 6-sided dice tell you which player might make an error based on the chart in green on the quick start pages. If you are rolling because of a hit on the on the batter's card, then you The 20-sided die is then compared to the "E" or Error rating by the player in that position on the defense. For example, if the Right Fielder were the position and Aaron Judge were in right field, you would see he has a RF E2. If the 20-sided roll is 11-20 then you subtract 10 from it BUT IT IS A CHANCE FOR A 2-BASE ERROR. Therefore if the roll is 1, 2 then Judge makes a 1-base error. On 3-10 he makes no error because that is higher than his E number. 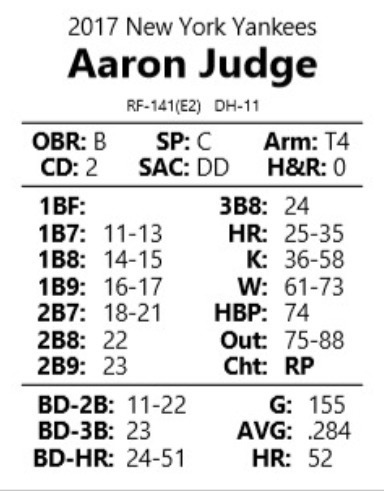 If the roll is 11-12 then Judge makes a two-base error, but on a 13-20 is not an error. two 6-sided dice to determine if the play is a Clutch batting play (2 to 5), clutch fielding play (6 to 9) or Z play (10 to 12). Clutch Batting. On a 2 to 5 the Random Number roll of 11 to 88 is used for the Clutch Batting on the batter's card which can result in a bases-clearing double, triple or home run, or nothing (a foul ball). Clutch Fielding. On a roll of 6 to 9, you need to look at the two 6-sided dice to determine which fielder has a chance for a clutch play. 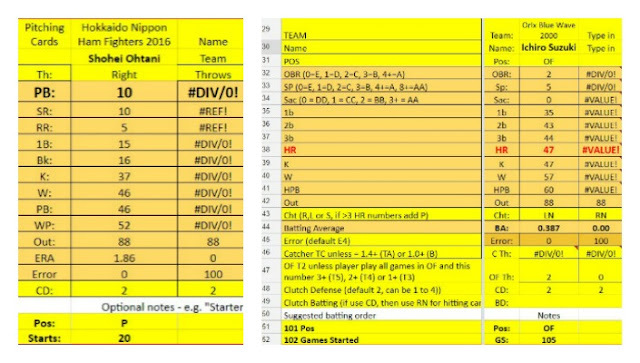 Using the player's CD of 1, 2, 3 or 4 refer to the chart on the Quick Start page in yellow and the defender will either make a great play - often a double play - or nothing will happen and roll again using normal play. Unusual Plays. On a roll of 10 to 12 you use the Random Number roll of 11 to 88 is used on the Z chart above, which can result on unusual plays from ejections to rainouts to triple plays. not out if they are not fast enough - they can only be thrown out on a roll of 6.
the fielder throws the runner out and if not the runner is safe. changes to make them more accurate. 1. Lower the safe range listed below by 20 with 0 or 1 out, and if there are 2 outs use the numbers below but do not add 20. Also, if the runner advances AND the random number is between 11-18 then a batter with either an OBR A or B takes another base on the throw attempt at the runner, and if the number is 21-28 AND the runner advances than only a batter who is OBR A can advance. 81-82 = T5 throws out runner trying to advance, others hold. 83-84 = same as above, except T4 or T5 throws runner out. 87-88 = runner trying to advance thrown out. 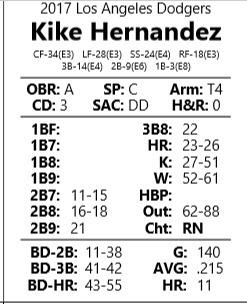 If you want to bunt you are given an option with the 6-sided in the QuickStart pages at the top. The original "bunt for hit" chart in Statis-Pro was completely unrealistic because it always advanced the runners. However, the 6-sided die option in the QuickStart above, or you can roll the 20-sided die instead of the 6-sided die for a steal or bunt and use the chart below, with the chance for a hit included in addition to sacrafices (technically a batter does either bunt for a hit or sacrafice, but for purposes of accuracy in results, all of these options are more accurate). For experienced players simply trying to replace a missing set of Fast Action Cards with dice, you must read no further. However, the next section plays out a sample game for those who were not familiar with Statis-Pro baseball and are learning the game for the first time. You can start by playing a sample game here between the Yankees and Dodgers, and then see "Make or Order Your Own Cards" (my order from big32dave at eBay was emailed within 2 hours or calculate on this google sheet) below whether to manage current or all-time major league players or player cards for minor league, college, American Legion, high school or even little league players. 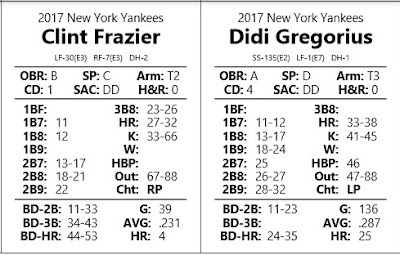 Here we include player cards for nine Yankees to bat against the Dodgers' Clayton Kershaw and nine Dodgers to bat against Yankee CC Sabathia. 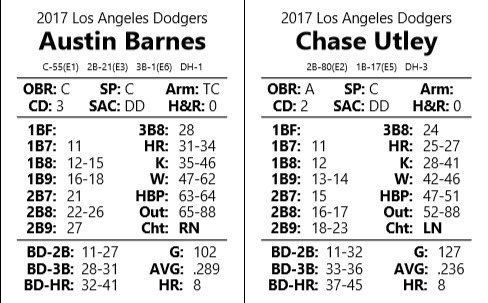 To try out the game, choose your line-up for both teams from the cards below and we will start with Clayton Kershaw against Aaron Judge. 1. 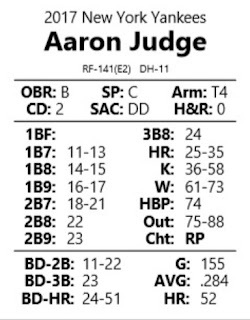 If you have or can get a Statis-Pro Fast Action card deck you flip one card to get the PB (the first card below shows a "9" so it would be on Judge's card), then a second card to get the "Random" number (on the second card below the Random number is "27" which would be a home run because Judge's card shows a home run occurs on a 25-35 on his card. 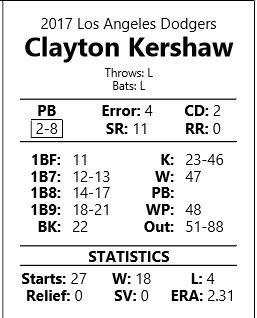 (Not that if the PB number were lower it would have been on Kershaw's card, and been in his stikeout range of 23-46. 2. You can generate the same results by rolling two traditional 6-sided dice and adding up the total of the dots (in this case "9" based on the blue dice to give the same result as the PB9 if you were using cards). You also need two 8-sided dice with the first number entering the "10s" number (we use yellow here so the "2" in yellow indicates the total will be 20-something) and the second die with a "7" on it makes the roll 27 to yield the same result as the card - a home run for Judge. The 20-sided roll of 1 day is used in advanced rules below. 3. 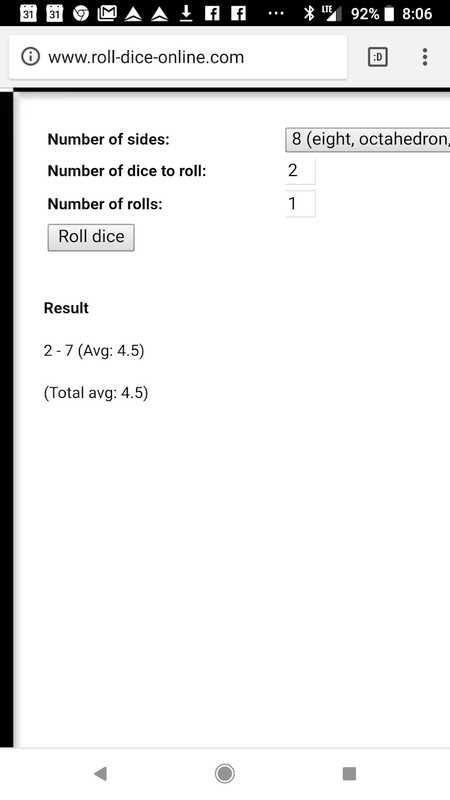 If you do not have the Face Action Cards or the dice, you can simply generate the rolls randomly on line by going to www.roll-dice-online.com. You need to first click "6" for Numer of Sides and Roll Dice - in this case generated a total of 3 + 6 that must be added together to total of 9 as the PB. You then must hit "8" by Number of sides for the random number and in this case the order is important as the "2" and then "7" rolls in the middle roll is read as 27 - the home run for Judge. The 20-sided roll of 1 day is used in advanced rules below. 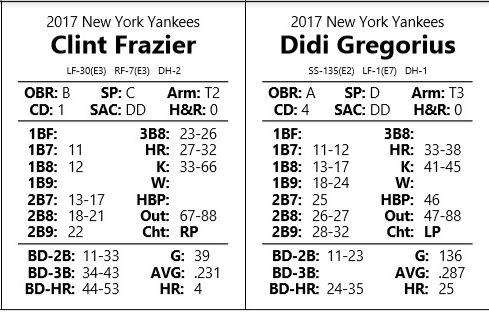 Then bring up the next Yankees hitter from the cards below to complete a 9-man line-up, and then do the same for the Dodgers to face the pitcher CC Sabathia to play a game using basic baseball rules with outs and hits as indicated on the cards. To play a very basic game, simply keep track of what base each player is on and how many outs there are in each inning. If you do not yet want to use the advanced rules below on baserunning, then simply have runners on base move as many bases as the batter who hit the ball, but with two outs let them go an extra base (1st to 3rd or 2nd to home on a single or score from 1st on a double). This is actually surprisingly accurate as runners actually take an extra base on a hit almost one-third of the time and are actually thrown out trying just over 1% of the time. 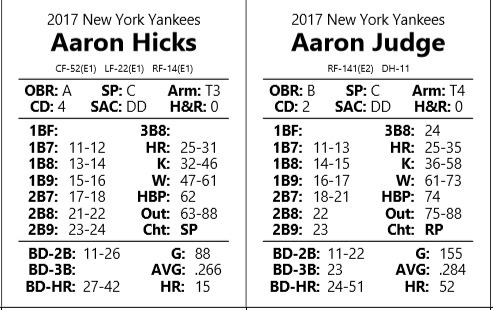 Here are the rest of the Yankees in addition to Judge and Hicks above to give you the 9-man line-up. One the Yankees have 3 outs in the first inning, CC Sabathia can pitch against the nine Dodgers below his card. 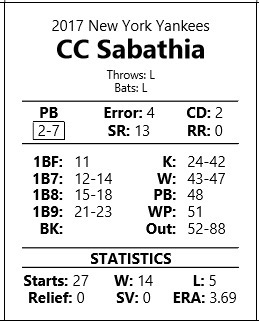 Making or Ordering the Rest of the Player cards for this or any past season, or for American Legion, college, high school, little league or the Minor Leagues. Once you get more cards and can pinch hit or change pitchers, you can add these factors. To get extra cards, you can order sets of cards for this or previous seasons through eBay for as little as $10, or even type in the stats to calculate your own cards on this google sheet. You just need the following stats to type into the google sheet and create new cards. Kershaw's SR is 11, which is his endurance. Every time he gives up a hit, walk, hits a batter with a pitch (HBP), throws a wil pitch (WP) or allows a run, lower that by one number. If Judge did hit a home run against him that would be a hit and a run allowed and his SR would drop from 11 to 9. Once he gets to 0 you start to take numbers off of his PB. So if he was down to an SR "1" and then gave up a solo homer to Judge, then he would be at zero so the run and hit Judge scored would instead lower his PB from 2-8 to PB: 2-6 and you would normally take him out of the game for a reliever. When playing a series or season, a pitcher who starts a game should rest the next 3 games, a reliever who faces at least 12 batters should rest 2 games, and a pitcher who faces at least 6 players should rest 1 game. A batters Home Run range can be no better than 32-36 (5 home run numbers and strikeouts on the card must start by 37). Therefore a player who had a 41-42 for home runs would push those two homers down the card to a 35-36, and then push the same number of triples, than doubles down to the lower numbers. If a player had a 21-28 on home runs (8 home run numbers) then they could only keep 5 home run numbers and would thus be a 24-28 on home runs. A Very Part-time pitcher cannot have a PB higher than 207. (80 or fewer position games, 16 or fewer starts as a pitcher, 32 or fewer relief appearances). A batters home run range can be no better than 32-38 (7 home run numbers). A pitchers PB can not be a 2-9, so much be lowered to a PB 2-8. One last option is to play the new international rules for extra innings. The version I am using is that beginning in the 10th inning the next two batters scheduled up basically get intentional walks - so the third batter of the inning always comes up with runners on 1st and 2nd and no outs until someone wins the game. (the actual rule allows managers to pick where to go to in the lineup for those 1st two players to put on base starting in the 11th inning, but I just keep it to the next two batters in the line-up in the 11th). The other variation I use is to count every game as a 3-game series with goes to the winner of the game 2 games to 1 UNLESS they win by at least 5 runs, in which case they are awarded a 3 games to 0 edge in the record. If you do this the home team is still allowed to hit in the bottom of the 9th if they are ahead but by less than 5 runs in order to try to turn it into a sweep. To prevent one ace reliever from coming in and pitching a bunch of innings, I do not allow a pitcher to appear in as many innings as his RR (so an RR of 3, can only appear in part or all of 2 innings). 4d. Tips on storing the team's cards between games. i. 4 cards facing you can start with the starting pitcher who should start the next game. Behind him an backward can be any reliever who needs to skip that game because he faced at least 6 batters last game or 12 batters the game before. Then the pitcher who will start the next game, with any relievers reversed behind him who pitched to at least 12 batters and thus needs to rest that game. Then the 3rd and 4th pitchers, with 4th being the one who started the last game. ii. The relievers who are rested to pitch the next game can then all be put in any order facing away from you under the starters. iii. The bench players who do not usually start can then be under the relievers but facing toward you. Therefore the next time you are ready for the team to play, once side has the starting rotation, the other the starting line-up, and all pitching and bench reserves are in the middle. Here is my season blog.